Eclipse Champion Abel Tasman (fifth), multi-surface specialist Catholic Boy (sixth) and sprinter Catalina Cruiser (ninth) vaulted into this week's NTRA Top 10 Thoroughbred Poll following impressive weekend victories. For the second week in a row, the NTRA Top 10 Thoroughbred Poll was led by the west coast-based older horse Accelerate, who accumulated nine first place votes and 346 points. Retired Triple Crown winner Justify remained in second place with 27 first place votes and 314 points. New-York-bred Whitney winner Diversify held third place with 274 points, including two first place votes. The 3-year-old filly sensation Monomoy Girl ranked fourth with 236 points. 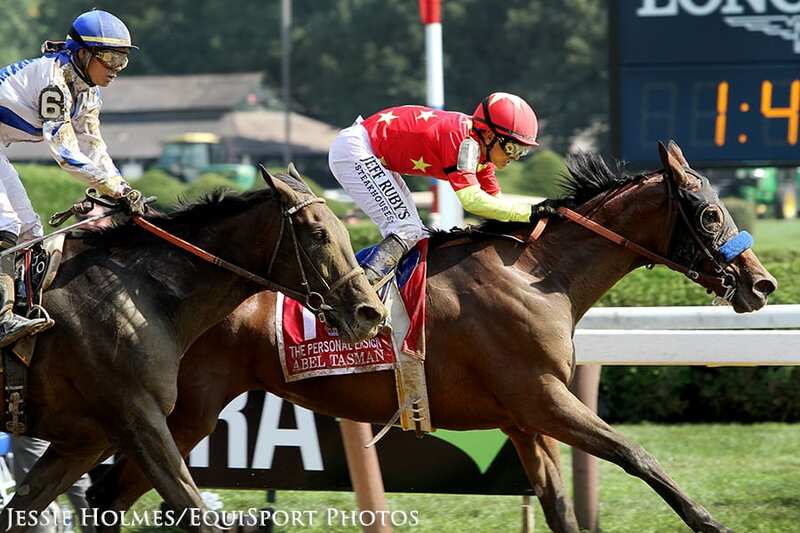 Abel Tasman, last year's Eclipse Award-winning Champion 3-Year-Old Filly, held off a late surge by Elate and an objection, to score a neck victory in the Grade 1 Personal Ensign at Saratoga. The victory catapulted Abel Tasman to fifth in this week's poll with 176 points. Catholic Boy, romping four-length winner in Saturday's Grade 1 Runhappy Travers Stakes Presented by NYRA Bets at Saratoga, moved to sixth on the poll with 156 points. The Travers victory cemented the 3-year-old Catholic Boy's reputation as one of the nation's top 3-year-old colts and one of the sport's most versatile top level performers in recent memory. Prior to the Travers, Catholic Boy won the Grade 1 Belmont Derby on the turf. Sistercharlie (99 points) ranked sixth followed by Mind Your Biscuits (97 points) and Catalina Cruiser (75 points) who scored a seven and one-half length victory in the Pat O'Brien Stakes Saturday at Del Mar. Recently retired Eclipse Champion Unique Bella rounded out the top 10 with 47 points. The NTRA Top Thoroughbred Poll is the sport's most comprehensive survey of experts. Every week eligible journalists and broadcasters cast votes for their top 10 horses, with points awarded on a 10-9-8-7-6-5-4-3-2-1 basis. All horses that have raced in the U.S., are in training in the U.S., or are known to be pointing to a major event in the U.S. are eligible for the NTRA Top Thoroughbred Poll, which continues until November 5, after the Breeders' Cup World Championships. This entry was posted in NL List, Racing and tagged Abel Tasman, accelerate, catalina cruiser, catholic boy, Justify, National Thoroughbred Racing Association, NTRA, ntra top thoroughbred poll by NTRA. Bookmark the permalink.